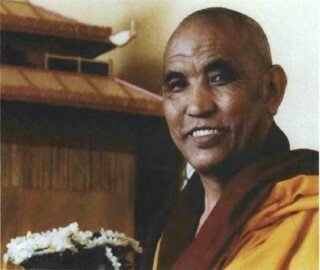 Khensur Rinpoche (Lobsang Tenzin) is one of the most respected scholar-adepts in the Gelug school of Tibetan Buddhism. He is a retired Abbot of Gyume Tantric Monastery in South India, thus conferring upon him the title of “Khensur.” Rinpoche currently serves as one of the primary teachers at Sera Monastery, where he has thousands of disciples, and has taught in the United States and Europe. The following excerpt is from a talk he gave at Portland, Oregon’s Maitripa Institute in late 2006. To have taken on the interest of undertaking a study of Buddhist philosophy, to allocate time in your life to undertake this special study, this is a very fortunate thing to have decided from your own side. To study Buddhism, you don’t have to become a Buddhist. What is unique about Buddhism is that it isn’t only about having blind faith or trust or belief. The many rituals of Buddhism that you may have been exposed to, or the many recitations or offerings, all these kinds of formal things that you see in an expression of faith, this is just one branch of Buddhism. When we take the heart essence of the teachings of the Buddha, then the goal is to subdue or pacify one’s own disturbed, un-centered, negative mind: that is the heart essence.